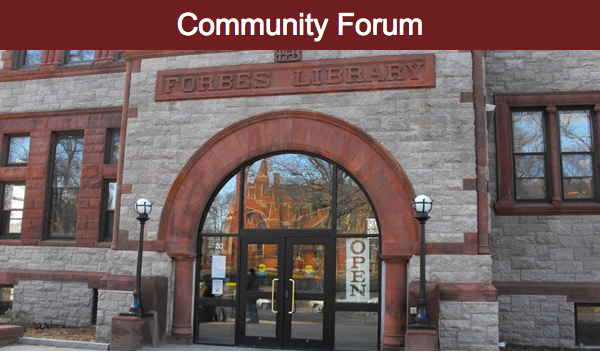 Forbes Library is developing a new strategic plan to identify priorities for services and programs for the next five years. Knowing your needs and interests will guide decisions on specific library goals and activities. We are soliciting feedback through our community survey and this open community forum. The forum will be facilitated by Kristi Chadwick who is a consultant with the Massachusetts Library System. She will lead the group through a brainstorming activity and the information and suggestions gathered will help inform the library's five year plan. Please consider participating in this important discussion. 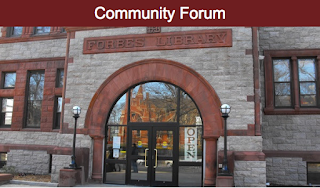 For more information contact Molly Moss, Assistant Director at 413-587-1017 or by email at info@forbeslibrary.org.